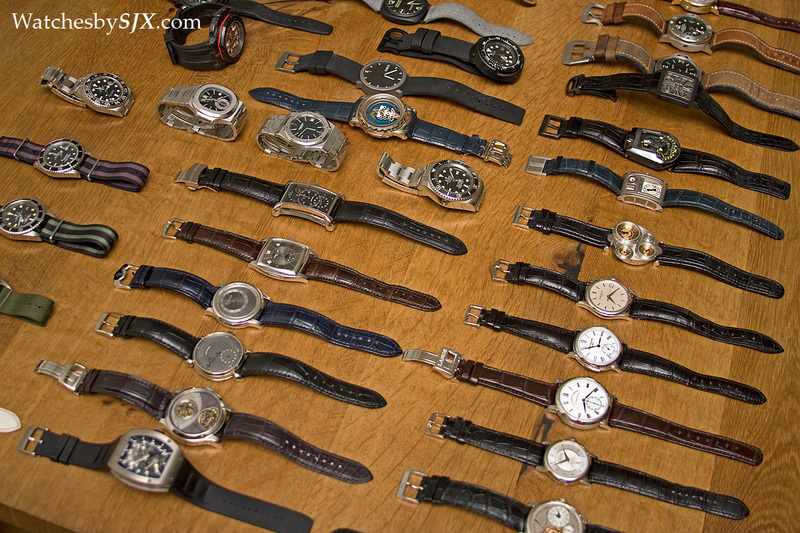 Editorial: Are There Too Many High-End Watches? Pricey, complicated timepieces are supposed to be singular and rare. Are they really? To answer that question, ignore the published statistics about Swiss watches exported. Instead, let me tell you a hypothetical story about hypothetical high-end watches. Of the 30,000 watches made by the imaginary watch company, say 20 percent are complications. Mostly basic ones like chronographs and annual calendars, but quarter of the complications output is the high-end stuff, minute repeaters, tourbillons and the like; watches with six figure price tags. So the fictional company makes 1500 high-end complications a year. For argument’s sake, assume a third, or 500, of those are tourbillons. Over a decade, that would mean 15,000 high-end complications produced, 5000 of them tourbillons – by a single hypothetical company. So let’s inject some excitement into the imaginary universe. Say there are 20 such established watchmakers, each different but successful in its own way, but competing in the same high-end segment. With 20 companies, a decade’s worth of production is 300,000 high complications, and 100,000 tourbillons. In the imaginary universe, the watch market is not static. The cumulative number of watches mostly sit in prized collections around the world – perhaps some unfortunate few languish in store windows unloved – but some of these watches will eventually come onto the market again. The vagaries of life mean that collectors pass on, go bankrupt or just get bored, and consequently sell their watches. Assume ten percent of collectors do that every year, and assuming a decade’s worth of production has been sold, 30,000 high complications – some 10,000 tourbillons – will be sold on the secondary market every year. This is in addition to the fresh production that the 20 fictional companies are still rolling off their production lines. Consequently, each year 30,000 high complications will arrive in stores, plus another 30,000 on the secondary market. Whether that’s a lot, too little, or just right, depends on the target audience. With high complications typically starting at US$100,000, being a mere millionaire is insufficient to afford one. Only ultra high net worth individuals – those fortunate individuals with over US$30m to their name – can reasonably afford such watches. Wealth-X, a research firm specialising in rich people, estimated in early 2015 that there are just over 211,000 ultra high net worth individuals (UHNW) around the world. Even if every UHNW individual on the planet bought a high-end complication over the course of a decade, there will still leftover watches. So the answer to the question in the title is obviously yes. That’s why modern complicated watches are now faring poorly in the secondary market, as evidenced by recent auction results. Over the long term the indigestion will only get worse, for two reasons. One being watch production continues apace. Despite layoffs here and there, as well as chief executives retiring, the luxury watchmaking machine is reduced but soldiering on. The other factor is the regurgitation of watches bought as investments when investing in high-end watches was a well regarded idea. That’s exemplified by the proliferation of modern Patek Philippe watches – factory fresh and sealed snugly inside a plastic bag – that turn up on the secondary market. A collector should, therefore, pursue truly rare watches. Vintage watches are often the suggestion, since their supply is by definition limited. However, the vintage watch market is frothy and fraught with danger, so prudence and specialised knowledge is required (and that will be the subject of a later editorial). Modern watches, on the other hand, that are produced in the smallest volumes are those made by independent watchmakers. Such watches are by nature rare. But the small size of such independents will be the salvation of some, but also the end of others. It’s tough to figure out which independents will prosper – remember the highest profile independent watchmakers of the 1990s, Daniel Roth and Gerald Genta? – but being a well run business is a start. A buyer needs to identify independents that will have healthy financials and a good distribution network; MB&F, F.P. Journe and Urwerk are oft mentioned candidates. It is not all doom and gloom for mainstream brands. Many still make wonderful, fine and impressive products. Watch collectors need to tweak their presumptions – expecting rarity everywhere is a contradiction in itself – and seek genuinely rare watches. EDITORIAL: What Does The Rising Swiss Franc Mean For Watch Buyers? Three days ago the Swiss National Bank lifted its cap on the Swiss franc's value against the Euro. Within hours the franc rose by as much as 40% against the Euro, with Swiss stocks moving in the opposite direction; on the same day shares in Richemont and the Swatch Group fell by as much as 16%. What does the franc's appreciation mean for watch buyers?